"I want to see more - show me sample pages"
"What will this do for me?" In short, I've been there, seen it and done it - the good the bad and the ugly. I know what works and what doesn't - and why - I have the scars to prove it. This material has been peer-reviewed by many people - academics, change management experts, CEOs, directors, trainers and consultants - it is credible. As an intelligent person, I am sure that you appreciate the serious limitations of any free public domain data such as this informational site and the various free email series that I provide - which is why I commend thes e-books to you. These e-books shows you specifically and in detail WHAT to do, HOW to do it and WHEN to do it. "What is the most that I and my family will gain?" Masterclass materials in the Ebook Format (as detailed above) comprising the complete Practitioners Masterclass & Quick Guide (this format is ideal for reference and a checklist). Includes Upgrade Option to the Gold Upgrade Package @ $90 and the Silver Upgrade Package @ $50 (should you wish to upgrade at any time). How is your Practitioners Masterclass different from comparable products on the market? I am aware of a couple of very good online products - that have undoubtedly benefited a lot of people. But, in my view, they are project focused and process driven. Whilst this project management based approach is effective - it does leave a lot of key areas untouched. The Practitioners Masterclass takes a much wider view and directly addresses the root causes of change failure - the people related issues. However they tend to be either academic and thus detailed and scholarly in approach, and not so easy or accessible for the "non expert" to apply "in the field", or their scope is restricted to the specific field of the authors' own research interests. As the sub-title of the Masterclass indicates - this is about "putting it all together". The Practitioners Masterclass is both holistic in its breadth and range yet deeply pragmatic and practical in approach. What are the uniques features of your Practitioners Masterclass and how does that benefit me? Most of this gets overlooked in a project-driven focus. How do I know whether what you are offering here is for me? The short answer, is that if you're reading this then it probably is! This website has over 200 pages and in excess of 200,000 words of original material. In addition there over 90 specific downloads, over 2,500 internal links and numerous links to high quality data sources, plus a free report and a fortnightly ezine. All of this should be more than enough evidence and proof of what you're likely to get in the Masterclass! Still not sure? Contact me. And in the meantime, just continue using this site and all of its many resources for free! Do you offer any sort of "after sales" service? You have appropriate direct access to me via the website, my email, landline and mobile phone. I am probably one of the most accessible people on the internet! There is a page at the end of the Practitioners Masterclass detailing all of the different ways of moving forward. In summary, you can Contact me with any general questions, specific questions re a change initiative are routed via the "Ask the expert" page on the site. Phone support and/or consultancy and/or interim management is available here: Practical support. Aren't you just rehashing all the stuff on your website - so why should I pay for your Practitioners Masterclass? Much of the theory is covered on the website. What you are paying for is the "how to do it" and the tools and material to share that "how to do it" with your colleagues. Yes, and you also have the full protection of PayPal and your credit card company. If you're still a little bit unsure, then just let me know what your concerns are - email me your questions and I'll do my best to answer them. Once you have successfully downloaded the materials examine them carefully - if you feel unhappy with your purchase then please get back to me within 10 days of making your payment, let me know your concerns and if I can't resolve them to your complete satisfaction I will refund you. Are there any restrictions on how I may use the Practitioners Masterclass? 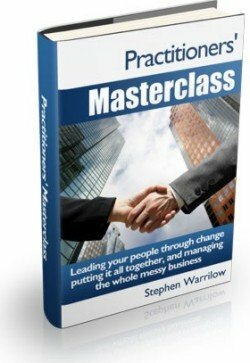 Unlike other products, you are licensed for use with 5 other people - this means that you can share, copy and distribute copies of your Practitioners Masterclass materials with your boss, colleagues or clients - up to 5 other people in addition to yourself - ideal for training and development in small groups. If you want to use Practitioners Masterclass materials with larger groups or for a whole organisation - multi-user licenses for teams and group use are available at very attractive rates - please contact me for full details. You may not resell, repackage or republish any of this material in any form. I have a question for you - how do I contact you now?